I received an amazing book this week: Paws And Whiskers. It's a brilliant anthology of animal stories, chosen by the great Jacqueline Wilson... and Varjak Paw is one of the stories she chose! "I think my most delightful and interesting interview ever was with SF Said. He knew so much about children's books and we found we had all sorts of things in common – we even shared a passion for gothic silver jewellery. He told me that he'd written a children's book himself and so I asked him to send me a copy when it came out. I was thrilled when I read Varjak Paw. It's new and contemporary and original, and yet it already reads like a true classic of children's literature." It's absolutely amazing to see one my favourite writers saying such things about my work! Here's a link to the interview she mentions, which we did back in 2001; and here's some more information from her own website. 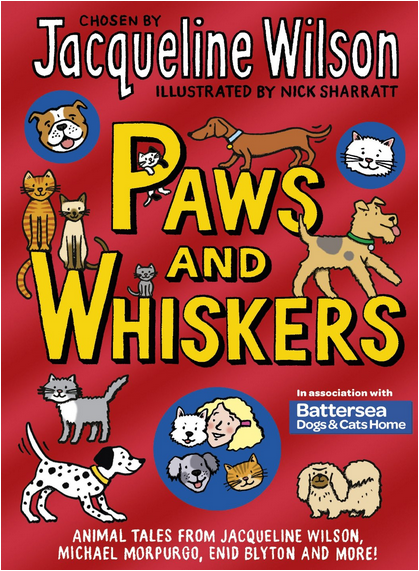 Please do buy a copy of the book if you can – royalties from every copy sold will go to Battersea Cats and Dogs Home!